DefCon hacker conference participants were in for a nasty surprise this year. 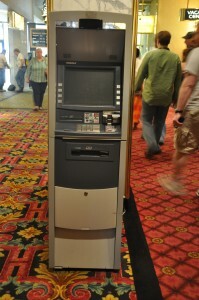 A fake ATM kiosk set up in the Riviera Hotel Casino in Vegas was discovered during the conference. What is not known is if it was set up by one of the hackers in order to trick their associates, or if it was sent up by someone with a more evil purpose. Given how tight casino security typically is, you have to find it terribly amusing that they have no idea how long the fake ATM was sitting there, how much information was captured by it, or who put it there. The ATM was placed in such a way as to be invisible to the security cameras placed throughout the casino, yet also directly in front of the security office. Security authorities have seized the device, which was set up to capture card data.